1 Leases are 39 month, with $5000 cash cap reduction. All leases exclude tax, title, registration, first payment, insurance and are additional. The Cayenne Platinum lease special is 7,500 miles per year and the Macan, Cayman, Boxster and 911 are 5,000 miles per year. Closed-end lease offered to qualified lessees with approved Tier 1 credit by Porsche Financial Services no exceptions. No security deposit required. At lease end, lessee pays excess wear, $.30/mile over allocated miles and $350 termination fee. All leases include Porsche Prepaid Maintance package for 2 years/20,000 miles ( 1 service per Porsche Maintenance plan per year or every 10k miles which ever comes first). This plan is upgradeable for longer term and miles. Specific vehicles and options are subject to availability and your price may vary. Only one available at this price and prior sales excluded from all offers. This offer can not be combined with any other offers. Must take delivery by 7/5/2017. 2 Leases are 39 month, with $5000 cash cap reduction. All leases exclude tax, title, registration, first payment, insurance and are additional. The Cayenne Platinum lease special is 7,500 miles per year and the Macan, Cayman, Boxster and 911 are 5,000 miles per year. Closed-end lease offered to qualified lessees with approved Tier 1 credit by Porsche Financial Services no exceptions. No security deposit required. At lease end, lessee pays excess wear, $.30/mile over allocated miles and $350 termination fee. All leases include Porsche Prepaid Maintance package for 2 years/20,000 miles ( 1 service per Porsche Maintenance plan per year or every 10k miles which ever comes first). This plan is upgradeable for longer term and miles. Specific vehicles and options are subject to availability and your price may vary. Only one available at this price and prior sales excluded from all offers. This offer can not be combined with any other offers. Must take delivery by 7/5/2017. 3 Leases are 39 month, with $5000 cash cap reduction. All leases exclude tax, title, registration, first payment, insurance and are additional. The Cayenne Platinum lease special is 7,500 miles per year and the Macan, Cayman, Boxster and 911 are 5,000 miles per year. Closed-end lease offered to qualified lessees with approved Tier 1 credit by Porsche Financial Services no exceptions. No security deposit required. At lease end, lessee pays excess wear, $.30/mile over allocated miles and $350 termination fee. 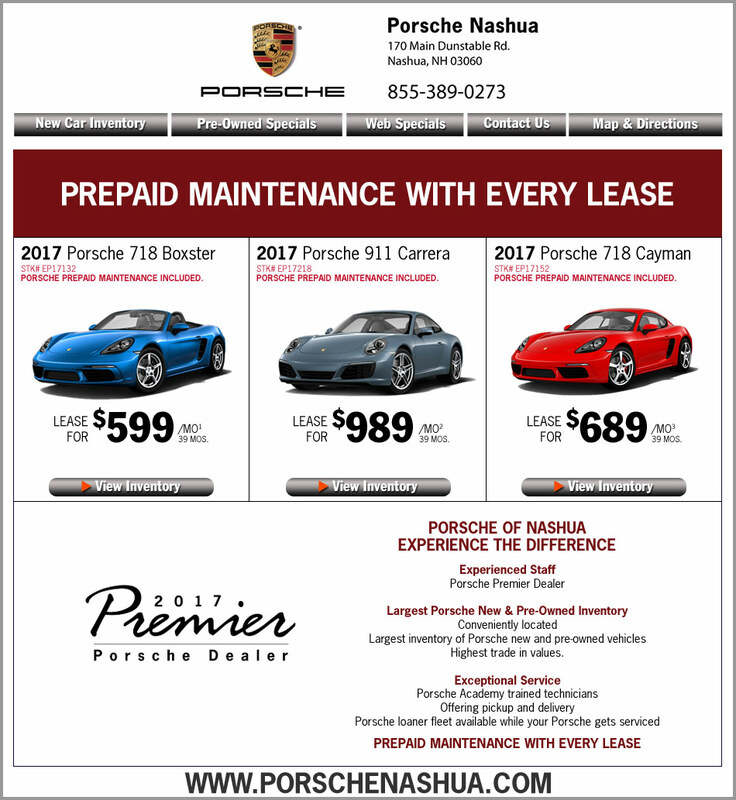 All leases include Porsche Prepaid Maintance package for 2 years/20,000 miles ( 1 service per Porsche Maintenance plan per year or every 10k miles which ever comes first). This plan is upgradeable for longer term and miles. Specific vehicles and options are subject to availability and your price may vary. Only one available at this price and prior sales excluded from all offers. This offer can not be combined with any other offers. Must take delivery by 7/5/2017.